block cell and radio communications on I-4 for nearly 2 years. A Florida man is facing a massive $48,000 fine for using an illegal cellphone jammer to keep commuters from using their phones while driving, the Federal Communications Commission (FCC) has announced. Jason R. Humphreys of Seffner, Florida had been using a cellphone signal jammer for 16 to 24 months during his daily commute on Interstate 4 to Tampa. Metro PCS first noticed the signal trouble and referred the matter to the FCC. The FCC in turn worked with local law enforcement to trace the source of the interference to Humphrey’s SUV. Humphreys admitted his actions to the authorities when caught. While using a jammer to force better mobile manners may have some appeal, devices that jam phone signals are illegal to sell or manufacture in the U.S. because they interfere with emergency communications. The FCC says that Humphreys’ jammer “could and may have had disastrous consequences by precluding the use of cell phones to reach life-saving 9-1-1 services provided by police, ambulance, and fire departments.” The Florida police officers involved report that they were unable to use their two-way radios while tracking down Humphreys due to his jammer. Humphreys has 30 days to either pay the fine or file a response with the FCC. 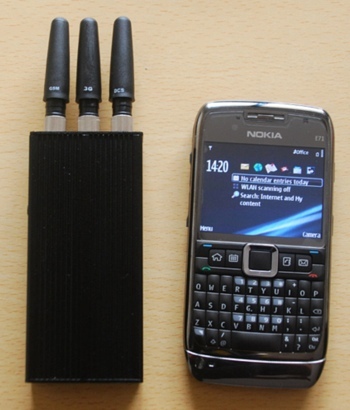 You can learn more about phone jammers and anti-jammer enforcement efforts at the FCC website. Isn’t that an exorbitant amount for simply carrying a jammer? It isn’t even a weapon. Americans are just crazy.